Binary inputs modules are used to connect regular push buttons or switches to the KNX bus. The device is flush mounted and compatible with any regular push button or free potential contact. An integrated temperature sensor is available on every device, moreover an external temperature probe may also be connected to the terminal connector. Each channel can be assigned to a KNX binary input. Supporting all standard KNX functions, with short and long press detection. See the gateway description page for more details on available KNX functions for each input. Binary inputs device can be installed in junctions box, panels or flush mounted behind regular push buttons. An optional housing can be purchased when required. Connection only requires plugging the four wires of the standard KNX cable. With its single line topology and the use of spare wires in the standard KNX cable, both buses can work in parallel. KNX bus is accessible at any devices, therefore KNX and ELAUSYS devices are easily interchangeable. No programming is required on the ELAUSYS devices, the complete configuration is performed in the gateway, therefore simplifying and reducing the commissioning phase to a single download using ETS tool. All devices can be installed and connected in the building and will not require any further access to complete the commissioning. All switches cover can be placed whereas conventional KNX devices would require opening the switches, pressing the programming button and downloading the software to each of them. See the gateway description page for more details on inputs configuration. 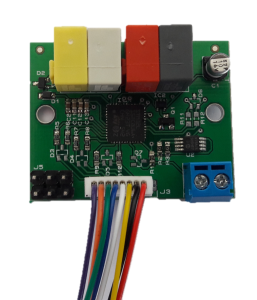 We offer a large choice of binary input devices to fit exactly to your installation needs, reducing overall installation cost by avoiding unused inputs.